Crystal wind chimes are beautiful garden fixtures that release pleasant sounds and rainbow prisms on sunny afternoons. Crystal wind chimes can be very simple, or ornate and antique looking. Whether to catch a few rainbows in a window or fill the garden with the sounds of bells, crystal wind chimes are beautiful additions to any home. Designers can string together new combinations of materials using parts from pre-made wind chimes, lighting fixtures, and jewelry making supplies to make the perfect wind chime to match any type of decor. The easiest way to get materials for crystal wind chimes is to buy and disassemble pre-made wind chimes. Mix and match the elements to get different looks and sounds. 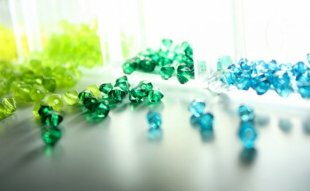 Pre-strung chandelier crystals come in bulk lots, so it is easy to find all of the prisms at once; however, designers can also hand pick loose prisms or those set for use in making jewelry. Add other crystal beads, stained glass, cut gemstones, or sparkly bells to the lengths of string. Each element adds a different look, and perhaps a different sound when it comes into contact with other pieces. Choose a particular wind chime sound, whether it is the delicate clinking of crystals along with the traditional notes of wooden, metal, or bamboo wind chimes. Bamboo chimes produce a hollow tone, while small, metal chimes make a noise closer to the high pitched sound of crystals. Find a pair of needle-nosed pliers for bending and attaching wire, wire cutters for cutting, eyelet hooks and a long length of strong chain to hang wind chimes. Depending on the desired look, designers may also need nylon-coated stainless steel wire, copper wire, or metal lengths of chain to string the elements together. These supplies often come together in a jewelry making kit. The hanging base of a wind chime is as important to its design as the crystals. Explore wind chime plans to decide whether to make the chime bases out of common craft supplies, lighting fixtures, or vintage and repurposed items. Anything will work, as long as the holes in the base are close enough for the pieces to knock together when the wind blows. Buy different gauges of pre-cut copper tubing and weld them together into fanciful shapes. Drill close, evenly spaced holes in the pipe to hang the chimes. Make various strings of crystals and chimes, attach them to the base, and then hang the chimes to blow in the wind. Use one large and one smaller embroidery hoop for the base. Spray paint embroidery hoops with metallic colors for added texture. Then, string chimes on the smaller, inner hoop, and attach that with wire to the larger, outer hoop, where the crystals hang. Designers can also source the base and pre-strung crystal pendants from a lantern or chandelier. To get the wind chime effect, remove several of the crystal strands and re-hang wooden or metal chimes in their place. Ornate Moroccan lanterns add an ethnic decorative element to crystal chimes, and are ideal bases because they are covered in small holes from which designers can string the crystals and chimes. In addition to chandeliers and lanterns, repurposed vintage and household items can give wind chimes a shabby chic look. Make bases from metal napkin holders and wire baskets turned upside down, or cut holes in an old decorative silver plate, a sawed-off bottle top, an old pail, or a simple stick from the yard. Spray paint objects to give them a new sheen. Hang the crystal chimes in a sunny window where the prisms send rainbows across the room, or outside on a tree branch to catch the wind. Watch for blustery weather, and take care to bring in crystal chimes because the glass may chip or break if prisms blow against each other in harsh winds. All the materials you need to make crystal wind chimes are available for purchase on eBay. Searching for crystal prism lots or ready-made chandeliers can save you time and money, or you can hand select interesting add-ons to your wind chimes by filtering search results according to category. For example, a search for "crystal prism" brings up several options of stones. You can also buy jewelry making kits to find several of the supplies that you need grouped together.